Last week I showed you Emily Warren Roebling in her court gown – as a painting, a photograph, and the extent gown. Most of you appreciated being able to compare all possible versions of the dress, though that actually ended up dragging ratings down a bit, as each version showed you something you wished wasn’t so obvious in another. It also made things a little hard for me, as some of you rated each different version, and I had to figure out what rating to take. Overall, Emily came it at 8.9 out of 10, with kudos for balancing event appropriate fashions, her age, and the wacky factor of court dress. Without the print, this dress is no different to dozens of other late ’40s, early ’50s dresses – Butterick has reissued a pattern that is basically this dress, and it’s just a slightly later version of the Dorothy Lara dress. But the print does make this quite a unique, striking dress -it would certainly be remembered among the frocks at a party. So what do you think? Has Adrian done a good job of blending everyday (well, very dressed up everyday) and avant garde? Is this the best thing since sliced bread? I like the pleats, the full skirt, and the dramatic print, but the style of the dress is otherwise pretty mundane. Love the shoes though! A 7 of 10. I like the overall shape, the shirred effect, the deep rich browns and ivory. That skirt would look great in a spin. But I feel it’s just a little too long, and that makes the big bell skirt, loads of fabric, and dark color feel very heavy. As for the print, I’d feel like a walking Panera advertisement. Have to think a woman in 51 would have a similar problem. It isn’t ugly, but it’s just too literal and I don’t think it adds anything to the dress except, as you said, a means of getting people’s attention. In one way, the image is too static for a dress that probably had a lot of movement to it. And it’s just sort of – hey, look. I’ve got a picture of bread on my dress. But the colors are great, and I do like how they’re dispersed through the dress, especially the solid dark band down the side of the skirt. If that photo was some abstract design, I’d be much more on board. But then the dress runs the risk of just being…well, kind of boring, doesn’t it? It is very witty, isn’t it! And political. 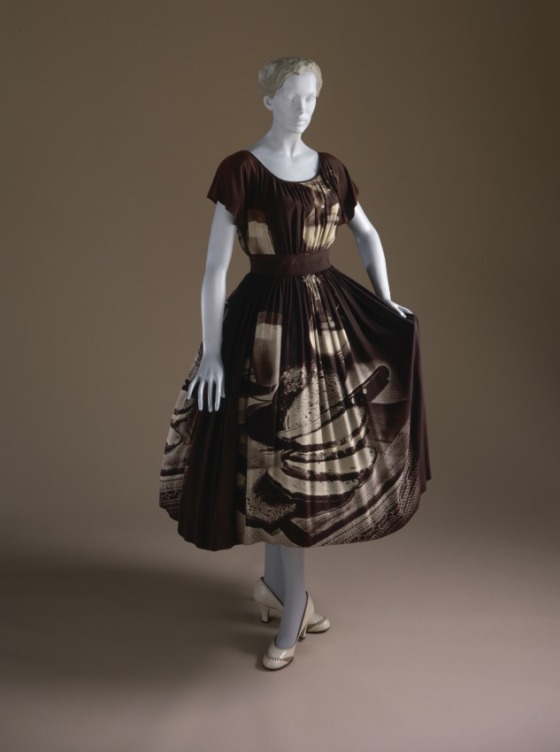 Here we have a very simple dress, of its time, in a print in a subdued palette. And then it is a breadboard, with a sliced loaf, and a tall glass of something possibly milky. So, the lady, the ‘loaf-kneader’, the mother, the domestic goddess. Not one that many women could carry off. But I like it. And there has to be another point in there for the finding of the perfect shoes for the dress. That was exactly my thoughts: a very political dress. There is a lot to interpret in this dress, with many different points of view. Maybe…7/10. Because I really don’t like the colors. This is one of those things that I appreciate, but don’t necessarily like. It’s clever, memorable, and wearable all at the same time, but from an aesthetic point of view I’m not sure about it. Something about the combination of those colours and that pattern just doesn’t appeal to me. 7/10, because it is so clever. At first I thought the print was just slashes of grey in a random pattern. Once I got a closer look and realized the print was *actually* sliced bread, I was less impressed. Whenever I rate a dress, I try to rate it in context… how well does it suit what it was made for. But I’m not sure what this dress was made for. Perhaps it’s a surprisingly modern bit of casual wear? Its drab color and easy fit make me doubt it was meant for a party. Maybe it was meant to be an interesting twist on a boring-go-shopping dress? Like it’s saying “I’m off to the market for bread, wearing my bread dress. I’m simple and wholesome, and I am self-aware enough to comment on it, tongue in cheek”? I dunno. It would stand out in any context, and I like that. If I had that fabric, I’d probably make a dress out of it because why not? So I give it 8/10 for being comfy, modest, quirky, and good at hiding stains, all good qualities for the scenario where I could imagine wearing it. That thing about hiding stains would be so true, but far from being modest I see it as something for prominent window display, a piece to show off the amazing new technologies in printing. Interesting how we all interpret things differently. This is really hard, because all I can see are the tedious jersey sack dresses of the mid 70s. The brown and the photorealistic print only add to that. So while I feel I should applaud the outrageousness of a frock featuring a loaf of sliced bread, I just dislike it. A least I know that I can look at something Adria did objectively, he tends to turn my head! I can see that print as “Latte Art”! Waffle Log), hits the shelves next year. I like the shape. And while I appreciate the potential of a political message in the print, I am fairly certain that not only would the message go over most people’s head (it’s that subtle and subjective), it would also kind of disappear if that gown was not held up by the dummy’s hand – making it practically invisible. Here’s a dress that would not look out of place today. The bold pattern is on trend, and I could imagine this worn with a contrast shoe (turquoise? red?) for a retro look. I have to admit…I don’t think it’s the best thing since sliced bread. I love it – its proportions would look amazing on a tall woman. The print, its interpretations aside, is just abstract enough to be completely concealed by the skirt’s pleats, thereby turning the fabric into a piece of very modern abstract art. The dark brown is chic – one gets tired of mid-century treacly sweet florals, one really does. The only distraction is the slight frump factor of the sleeves – sleeveless would really turn this one into a perfect daytime knockout. 9/10. Wow, people are reacting storngly to this one. It’s an interesitng exercise for me to read the comments, because random, funny, occasionally political prints on clothes is what I like to wear the most! I have a button shirt with photorealistic hotdogs all over it, for examle. These comments may be an indication of what people are thinking when they see my hotdog shirt! Iike shape and the bluntness of photograph would have beenso strange and refreshing at the time, I reckon, Myself, I love it, of course. It is beautiful, funny, possibly political, and no matter what, it gets people thinking. 10/10! I’m not a fan of this dress. The general shape is nice, I have one exactly like this that I bought in a mass market chain just a couple of years ago. It’s nothing special though and that makes it pretty boring, which would be perfect if you wanted the print to be the focus. It took me too long to see what the picture was though, for a long time I only saw it as a strange mixed pattern. If you want to send a message with the print, than it should be more obvious. In short this is a pretty, but boring, shape with a print that’s not standing out enough to make it interesting. 4/10. This! While wearing the dress, the print wouldn’t be completely obvious due to all the pleats. This would look far better with a small print – like red polka dots inside of white polka dots on a navy blue background and a red or white belt. As is, it just looks dismal. Also, the way it is pleated wouldn’t look pleasing on most body types.